IB Psychology Notes - The cognitive level of analysis: Cognition and Emotion - Evaluate one theory of how emotion may affect one cognitive process. The cognitive level of analysis aims to study the inner processes of the mind and how cognitive processes guide behaviour. As such, within this level of analysis, emotion has been investigated in terms of its cognitive influences. One theory of how emotion may affect the cognitive process of memory is Flashbulb Memory (FBM) suggested by Brown & Kulik (1977). Theory of FBM involves how emotion affects memory by enhancing it. FBM theory also have unique features distinguishing/that differ them from other memories in that they are more vivid, detailed, accurate, long-lasting, consistent and easily to remember. This is in contrast to normal memories, which most researchers are believed to be selective, unreliable and malleable (easily changed or distorted). Some events stand out in the memory much more than others. When the event happens, the person experiences a highly emotional state, extreme happiness, extreme sadness, etc. The result is that this event is imprinted on the memory. It can be personal or something that provokes worldwide interest, such as the assassination of President Kennedy in 1963 or the death of Prince Diana in 1997. FBM was firstly demonstrated by Brown and Kulik in their main study occurring in 1977. To investigate FBM and how it works (to support their theory). FBM can be explained in how emotion can affect/influence memory by either enhancing it or impairing it. Repression is used to describe a certain type of memory, usually of a traumatic type, when information cannot be retrieved as a result of being locked out of our consciousness. As such, this essay response will aim to evaluate FBM, with the use of supporting or studies or studies which oppose certain components of the FBM in order to uncover the validity of the theory. According tBrown and Kulik (1977), the event must be surprising and have real consequences for the person’s life. Some studies have indicated that childhood memories with high emotional context, such as high school graduation can be as vivid and clear as flashbulb memories of less personal importance, such as national events, e.g. Rubin & Kuzin (1984). Brown and Kulik also suggested that there may be a special neural mechanism which triggers an emotional arousal because the emotional event is unexpected or extremely important. At the time, it was only a hypothesis, but it is supported by modern neuroscience: in that emotional events are better remembered than less emotional events – perhaps because of the critical role of the amygdala. They also believed that this is a special type of memory because of the detail and accuracy with which the event is remembered and the fact that the structural form of the memory is always so similar. There has been some research untFBM such as by Conway et al. (1994). Thus, Conway claimed that this event met the criteria for FBM for British people as it was an unexpected and highly significant event pertaining to their culture, therefore arousing deep emotions, influencing the special neural mechanisms and therefore creating FBM of the event. One of the most significant research arguing the validity and accuracy of FBM is by Neisser (1982), and later on by Neisser and Harsch (1992). Neisser questioned the idea of FBM’s, in which he suggested that the memories are so vivid because the event itself is rehearsed and reconsidered after the event. According tNeisser, FBM may simply be a narrative convention. He explained this idea by saying that flashbulb memories are governed by the conventions of a storytelling schema, following a specific structure. In other words, when we recount important events, we do by using conventional storytelling techniques. Neisser also argued that FBM’s are subject to the same types of inaccuracy and forgetting as any other memories. Participants were asked to report on the circumstances of their learning about the challenger space disaster on 1986. Neisser and Harsch investigated people’s memory accuracy of the incident 24 hours after the accident and then again two years later. This thus suggests that FBM are not reliable (as influenced by post-event information). After five months, memories were vague, and subject to systematic biases. Found that memories were a blend of their own real experiences, and information that had come after the event. This study shows that FBM is no different than any other type of memory. It was found that there were discrepancies over time between what was recalled shortly after the accident and what was remembered nine months later. There were inaccuracies in the memories. FBM can be forgotten and thus cannot be considered as a special memory, but are products of ordinary memory mechanisms. Not ecologically valid because the Challenger was deemed not personal/emotional therefore not meeting the criterion of FBMs. This study showed that flashbulb memories are not different as they don't last as long as assumed by Neisser. In conclusion, FBM (affected by emotion) can influence the recall of memories. reactions and memories formed from real life events. Therefore there is high in ecological validity. 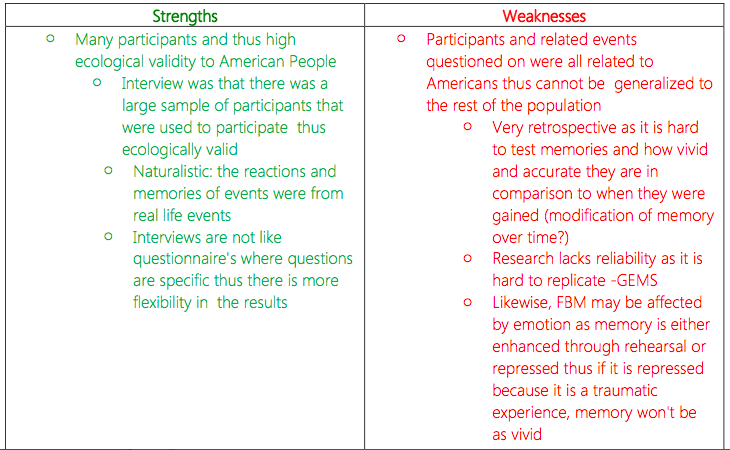 Overall Weaknesses: However, the studies can lack reliability as they cannot really be replicated. Therefore, we cannot test to see how consistent the results are. Also, much of the research is retrospective, and there is the issue that we cannot reliably measure how accurate people’s initial memories are.